The Guess Seductive Homme for Men is an alluring Eau de Toilette that never fails to mesmerize. This fragrance was released in the August of the year 2011 and has been a hit with the men ever since. The composition is defined by woody, aromatic, fougere notes and was created for the charming, charismatic man who’s a magnet among the ladies. This scent embodies seduction and makes an eloquent signature. Available in a 100ml glass flacon, this scent only enhances that irresistible charm. The Guess Seductive Homme for Men starts off with the intensely resinous, aromatic, and slightly spicy note of cardamom milk. It is complemented by succulent, juicy, honeyed faceted mandarin pulp, and rounded off by spicy but rosy pink pepper. The heart of Guess Seductive Homme is assorted, drawing its intricacy from three unique smelling notes: orchids, violet leaves, and vetiver. While orchid is known for lending a powdery veneer to floral bouquets, violet leaves bring in its own brand of metallic smelling, green, aqueous nuance. These two notes take solace in the musty, woody scent of vetiver that also contributes bitter chocolate and smoky facets to the composition. 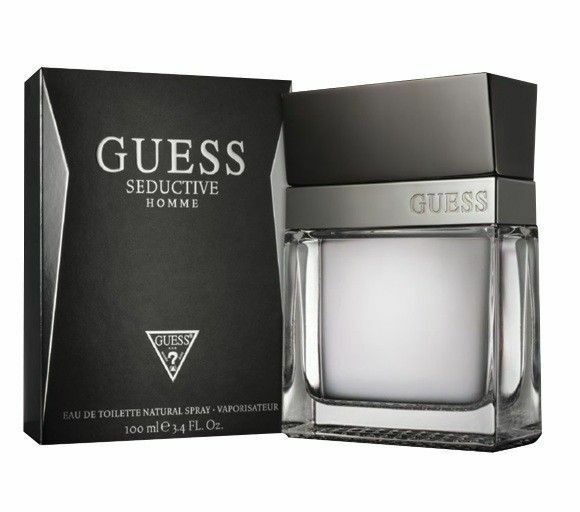 The base of the Guess Seductive Homme for Men is a mixture of dark and bright, warm and exciting. It consists of earthy patchouli, milky rich sandalwood, resinous, warm amber, and sensual musk. Fragrance disappears in less than hour, never buy.